Detroit -- The chants of thousands of people demanding jobs filled the air downtown as UAW President Bob King and the Rev. Jesse Jackson led the crowd to Grand Circus Park. The UAW and Jackson's Rainbow Push Coalition announced the Rebuild America: Jobs Justice Peace kickoff today at the downtown park. Jackson said the focus of the initiative is to ensure policy makers put people first when making decisions. The initiative calls for a moratorium on home foreclosures, a push for job creation and for ending armed conflicts overseas. "Detroit and Michigan are ground zero of the urban crisis," Jackson said. 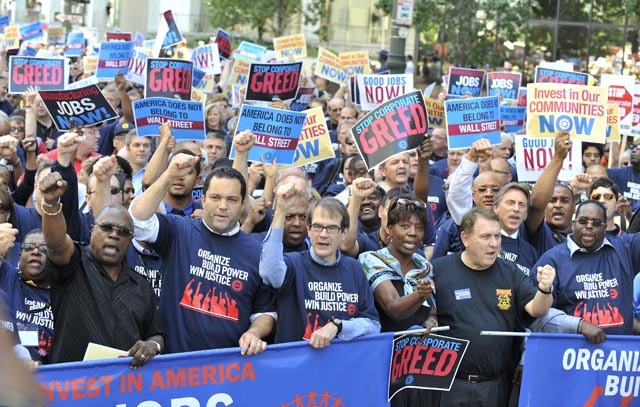 "It's time to enact real change for working families and all America." About 30 percent of Detroit is unemployed, Jackson said. Rep. Maxine Waters, D-Calif., also said Detroit was chosen as the kickoff site for the campaign because it is at the heart of the nation's economic fight. "This is the epicenter for the struggle for jobs, justice and peace," she said. "We have come here because we have no choice." Detroit and Michigan have been slower than other parts of the nation to recover from the economy's downspin. Carla Peterson of Detroit said the recovery has been slow because elected officials and even union officials have sometimes lost sight of the people they represent. "Today is a good start," said Peterson, a UAW member. "They need to put people first." Laura Clark of Lansing carried a sign at the rally that derided the North American Free Trade Agreement because she said it made it easier for companies to move job overseas. "I want Detroit to recover the jobs they lost," she said. Clark also would like to see some of the money spent on military actions diverted to putting people back to work. "We can spend money on war, but not on our people?" she said. "That's wrong." The rally was attended by a host of local and national leaders including Congressmen John Conyers (D-Detroit) and John Dingell (D-Dearborn), Ohio Congresswoman Marcy Kaptur (D-Toledo) and local reverends, Wendell Anthony and Charles Ellis. "Our region has suffered like yours," Kaptur said. "We have people who want to work but the jobs have been moved to other countries." Lansing Mayor and Democratic gubernatorial candidate Virg Bernero addressed the people gathered at the rally and asked for their vote. "You have something precious with your vote," he said. "We are not up in some ivory tower. We are down in the street. We are Main Street. Not Wall Street." Today's march was held as a way of celebrating the Rev. Martin Luther King Jr.'s delivering his "I have a dream" speech in Detroit on Aug. 28, 1963 before reciting it in Washington D.C.
A series of similar marches will be held across the country leading up to one on Oct. 2 in Washington, D.C.
© Copyright 2010 The Detroit News. All rights reserved.